U.K. Approves Joining Anti-ISIS Airstrikes In Iraq : The Two-Way The parliamentary vote comes after Prime Minister David Cameron urged MPs to authorize participation, saying the self-declared Islamic State poses a "clear and proven" danger to his country. British Prime Minister David Cameron addresses the Houses of Parliament on Friday. 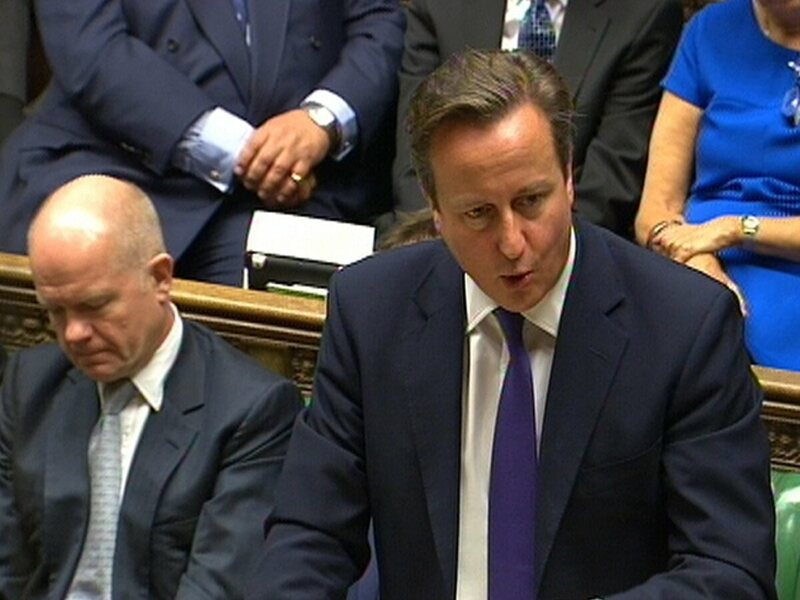 He urged MPs to authorize the U.K.'s participation in anti-ISIS airstrikes. The British Parliament has voted to approve the U.K.'s participation in U.S.-led airstrikes against the self-declared Islamic State in Iraq after Prime Minister David Cameron told MPs that the extremists pose a "clear and proven" threat to British lives. The 524-to-43 vote in Parliament came after a lengthy debate that followed the latest U.S. airstrikes in Iraq and Syria on targets of the hard-line Islamist group, also known as ISIS or ISIL. The strikes hit oil installations for a second consecutive day. "I believe it is our duty to take part," Cameron told members of Parliament, ahead of the vote, stressing that no British ground forces would be involved. "This international operation is about protecting our people, too, and protecting the streets of Britain should not be a task that we are prepared to entirely subcontract to other air forces of other countries." In the latest action against ISIS, the U.S. Central Command says in a statement that American warplanes and drones conducted five strikes south and southwest of Kirkuk, destroying Islamic State vehicles, including Humvees and an MRAP. Two other strikes in Iraq, one west of Baghdad and another near Al Qaim destroyed various structures, including a command and control node, the statement says. "In Syria, three airstrikes south and southeast of Dayr Az Zawr destroyed four ISIL tanks and damaged another," it says. It wasn't clear whether any of the five Arab partners that joined in previous airstrikes also participated in the latest round. Jordan, Qatar, Saudi Arabia, Bahrain and the United Arab Emirates — including that country's first female pilot — participated in previous attacks. The Associated Press, citing the Britain-based Syrian Observatory for Human Rights, says: "The strikes hit at least two oil-producing areas in Deir el-Zour province overnight. It says air raids also targeted the headquarters of the Islamic State group in the town of Mayadeen early Friday." "Another activist collective, the Local Coordination Committees, also reported four strikes on Mayadeen that it says were conducted by the coalition." Meanwhile, NPR's Brian Naylor reports that FBI Director James Comey says the U.S. believes it has identified the man who beheaded two American journalists in videos released by the Islamic State. But in a briefing with reporters, Comey declined to make the name of the suspect public. A masked executioner with what sounds like a British accent is seen in videos showing the beheading of James Foley and Steven Sotloff. "Comey also said that he's not confident at all that the ability of the terrorist group Khorasan was disrupted by U.S. airstrikes this week, and that the group remains at the top of the FBI's list of terrorist concerns," Brian reports.